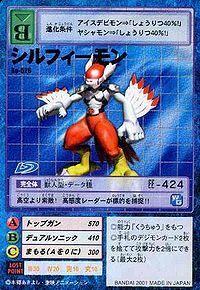 A Beast Man Digimon which Jogress-evolved from Aquilamon and Tailmon. It possesses tenacious leg strength, and its leaping power is said to reach great heights. Also, it is able to fly about by spreading both of its arms and soaring like a glider after leaping high into the sky. Because it processes the information detected by the radar on its ears as images, and transmits it to the head-mounted display equipped to its head, it is able to accurately find the opponent regardless of day and night. 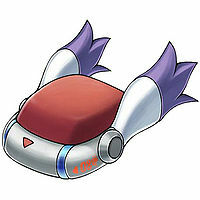 Its Special Moves are firing off energy shots while extending both of its arms ahead of itself (Top Gun), and gliding at super-speed from the sky above to crash a shock wave into the opponent (Dual Sonic). 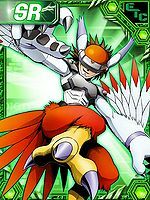 — Digimon Adventure 02: "Love Storm: Silphymon"
n., A misspelling of sylphi, from sylphid 「シルフィード Shirufīdo」, more commonly called sylph, an elemental spirit of the air. 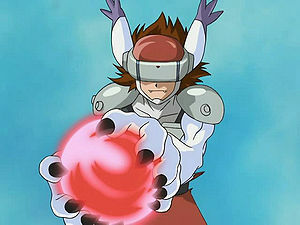 Anime/Manga Digimon Adventure 02: "Love Storm: Silphymon"
Top Gun  トップガン Toppu Gan Static Force/Top Gun Creates an energy ball in its hands firing towards the opponent. Dual Sonic  デュアルソニック Dyuaru Sonikku Static Force/Astral Laser/Dual Sonic Laser/Sonic Blades Creates an energy duplicate of itself, firing it at the opponent. Airfield  エアフィールド Eafīrudo Air Field Creates a tornado and sends it against the opponent. 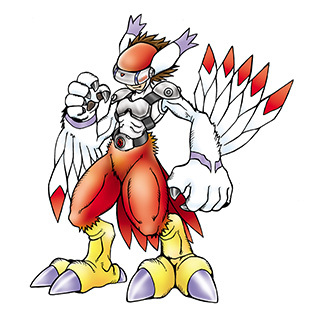 Silphymon was first formed when Miyako, Hikari and Ken were trapped within the World of Darkness and attacked by a Blossomon that was created by Archnemon. Hikari was too frightened to move but Miyako managed to snap her out of it and told her that as long they were friends, Hikari was safe. At that moment, the hearts of Miyako and Hikari were beating as one, causing their Digimon partners to perform Jogress Evolution. The newly formed Silphymon managed to destroy Blossomon and get everyone back into the regular Digital World. 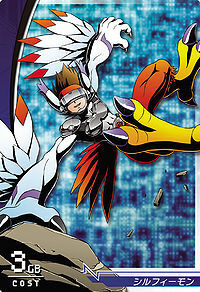 Silphymon eventually was needed to fight the likes of Archnemon, Mummymon and Black War Greymon. 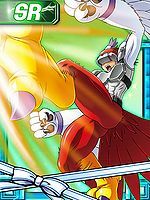 On the night of December 26, Silphymon fought Lady Devimon of the Demon Corps. 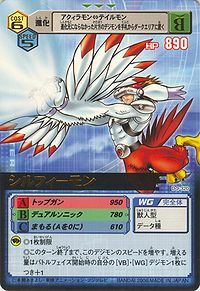 Despite its promise to Miyako, Silphymon (with Aquilamon in control) killed Lady Devimon when she was going to kill Miyako. Silphymon was involved in the final battle with Belial Vamdemon. 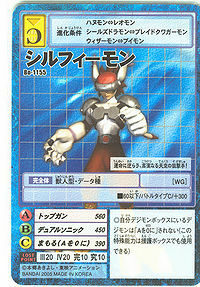 Silphymon is the Partner Digimon of Inoue Miyako. 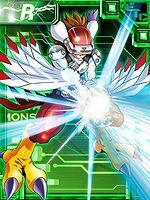 Evolves without Jogress with Tailmon. 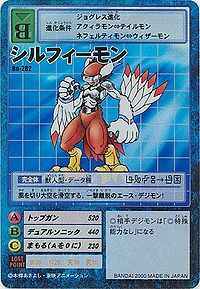 Can evolve in Valkyrimon. Silhpymon evolves from Aquilamon at level 31. 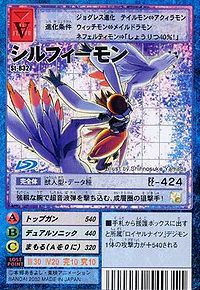 Evolves to Valkyrimon at level 41. Can be evolved from Aquilamon if above level 36, or can be found at Tropica Islands. 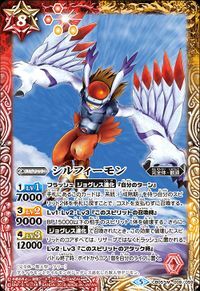 Can evolve to Valkyrimon if above level 52 and Bird EXP above 12000. Silhpymon evolves from Aquilamon at level 25. Evolves to Hououmon at level 41. 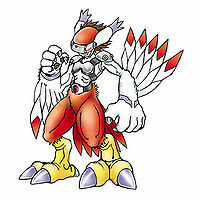 Evolves from Aquilamon when Jogressed with a Tailmon. 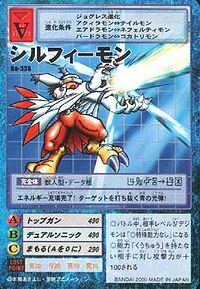 Can evolve to Valkyrimon when Jogressed with Garudamon. This stratospheric sniper uses its strong arms to fire supersonic bullets! 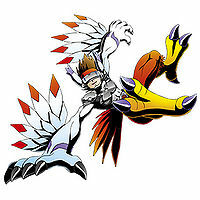 This ace Digimon flies through the skies, defeating enemies with a single blow! Energy charging complete! It fires a blue ray of light that pierces through the target! It detects its enemies from the air, and captures its target using its highly-sensitive radar!! 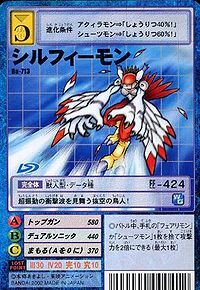 This bird-man fires super-vibrating shockwaves as it plunges out of the skies! This noble shooter of the sky defies its fate! 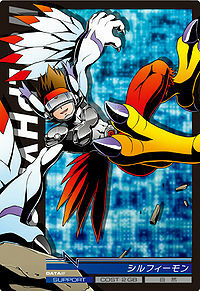 The Jogress evolved form of Aquilamon and Tailmon. 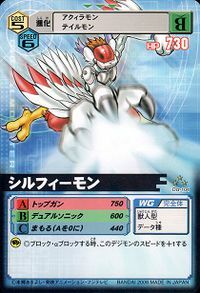 It uses the jumping power exhibited by its well-developed legs to leap into the sky, gliding down and using the radars in its two ears to capture the enemy. 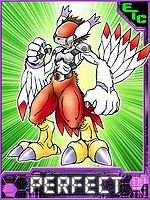 A Beast Man Digimon which Jogress-evolved from Aquilamon and Tailmon. 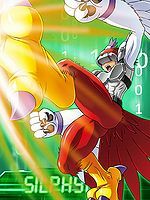 Entry for the 3rd Digimon Illustration Contest by Yamada Shinnosuke (used on St-832) Illustration for the Battle Spirits Collaboration Booster: Digimon Our Digimon Adventure.